Meet Google's new Pixel 2 and Pixel 2 XL- Dual Pixel Cameras. Google launched its Pixel 2 and Pixel 2 XL smartphones three days ago, 04 October as promised. The launch event actually was held in San Francisco where some attended the conference in person, while others streamed the event live on their various devices via available means. For us who weren't opportuned to attend or stream the live event on our devices, Oshetech has discussed everything you need to know about the event, and of course, the main reason for the event; the launching of Pixel 2 and Pixel 2 XL smartphones. We shall be discussing the features of all these Google’s flagship products throughout this week on Oshetech.com, so please do come back to hear more from us. But this post is dedicated only to the new Pixel smartphones: Pixel 2 and Pixel 2 XL. These two smartphones was announced during the launch, comparing their specifications, they are both identical though, there's a slight difference. The rumoured specs were true as the Pixel 2 and Pixel 2 XL were announced to run on Android 8.0 Oreo Operating System, feature Snapdragon 835 processors, 64GB or 128GB storage option, 4GB RAM for smooth performance. Like I mentioned earlier, the pixel 2 and pixel 2 XL are almost identical, with just a slight difference in the design differentiates one from the other. The Pixel 2 is built with a 5-inch AMOLED screen display, having 1080p resolution (for a density of 441 PPI), Gorilla Glass. Its body is built with metal and glass; featuring IP67 dust and water resistant. The Pixel 2 XL is slightly bigger than the pixel 2, having 6-inch AMOLED 18:9 screen display with QHD+ alongside 2880 x 1440 resolution (for a density of 538 PPI). The Pixel 2 XL has exactly the same body build up as the Pixel 2, that is to say both devices are built with metal and glass being water and dust resistant. Both Pixel smartphones supports an Always-on display, which will continually listen to audio playing around you (even from radio), which empower it to display song information without following the normal process, all you need do is click on the song title from the Always-on display. With these Pixel phones, you'll experience an improved Google Assistant bringing more features especially to the pixel camera. Both handsets also supports “Active Edge”, meaning you can squeeze the sides of your phone to activate certain functions. It's sad that the 3.5m headphone jack is no more. Instead you'll rely on the USB Type-C port for wired headphones, and you can not use wired headphones on the phone while it's charging. Though, at the front of these pixel smartphones are stereo speakers. On the back of these pixel smartphones is found a fingerprint sensor which Google says is the fastest on a smartphone. This actually got me amazed. 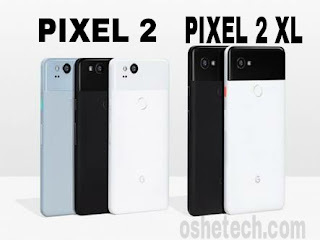 Looking at the back of these Pixel smartphones are a single 12.2- megapixel camera with f/1.8 aperture built on them, but using the camera tells you it has the functionality of a dual camera. This is what Google was referring to as dual camera. Google actually performed a dual camera trick with a single camera. The single camera makes use of something Google is referring to as dual-pixel sensor which literally splits every pixel in two. Unlike last year when Pixel was 1.55μm sized, this year’s pixel is a little bit smaller having 1.4μm. One benefit of this small pixel is that it allows for faster autofocus, and just like the iPhone 8 Plus and iPhone X, Google said it can offer “portrait mode” which include blurred background effect. This works without a second camera, and that's because the pixel camera acts like the second lens which allows the camera shoot a second image ever-so-slightly offset from the previous shot. With this feature, Google can establish depth map for the purpose of allowing it identify the foreground and background of a photo and make the subject more pronounced by blurring out every other thing found in the image. Google added that the portrait mode works also on objects. Also, this portrait mode feature is enabled on the 8-megapixel front-facing camera, despite the absence of split pixels in it. The camera supports some augmented reality features like the AR stickers, this will enable you add emoji and 3D characters into photos and videos as you're capturing the event/scene. These Pixel smartphones will be the first to feature Google lens. When this is activated, you'll be able to position the camera to different objects and let Google instinctively display information on them. The pixel cameras are indeed packed with lots of amazing features. The Pixel 2 is powered by a 2,700mAh sealed battery while the Pixel 2 XL is packed up with a 3,520mAh sealed battery. It was said that these smartphones come with fast charge feature. According to a said statement by Google, “you can get 7 hours of charge in just 15 minutes”. The Pixel 2 will be available in Black, White, and kinda blue colours. The 64GB storage model price will go for $649/ £630, and $749/£730 for the 128GB storage model. The Pixel 2 XL will be available in just Black and White colours. Its price tag for the 64GB storage model is $849/£830 while the 128GB model will go for $949/£930. Both Pixel smartphones will be released on October 17. Whereas, pre-order has been ongoing since the launch of the devices on October 4. Above is all you need to know about Google's latest flagship Pixel 2 and Pixel 2 XL smartphones; its specifications, price and release date. Thanks for visiting Oshetech.com, please do come back for more tech info. Meanwhile before you close this page, help us share this post on any social media you belong to. Also share your views with us using the below comment box.